From 1865 to June 30, 1921, passenger lists (RG 76), which contain information such as name, age, country of origin, occupation and intended destination were the official record of immigration. The passenger lists from 1865 to 1921 are arranged by port and date of arrival. Between 1919 and 1924 the Department of Immigration and Colonization introduced the use of the Form 30A as the official record of immigration. From June 1, 1921, to December 31, 1924, passengers were required to complete and submit to the immigration officer the individual manifests (Form 30A, RG 76 C1j) at the ports of arrival. The Form 30A was a substitute for the large sheet passenger list manifests that had been previously in use. A separate form was required for each passenger and a parent or guardian was asked to fill out the form for a child. Passengers in transit to the United States were not required to fill out the Form 30A. The use of Form 30A was inconsistent. Some immigration offices were using them as early as 1919, while some offices continued to use the sheet manifests as late as 1922. For the years from 1919 to 1922, a passenger's name might appear in one or both series. If you cannot find a reference to your ancestor in Forms 30A, then we recommend that you search the passenger lists for that period. The use of Form 30A was discontinued as of January 1, 1925. From that date, the use of large sheet manifests was reinstated. The Form 30A records were transferred to Library and Archives Canada (LAC) by Citizenship and Immigration Canada in 1997. The microfilm reels were produced by the Department of Citizenship and Immigration during the 1950s and 1960s. The originals were destroyed after the microfilming. Note that in the earlier version of Form 30A used in 1919, the names of accompanying dependents were usually included with the head-of-household, not on separate forms. Returning Canadians: That question was intended to identify passengers who were born in Canada who had not become aliens and British subjects who had been residents in Canada and were returning to Canada after a temporary absence. Returning Canadians were required to answer only questions 1,2,4,5,6,8,9, 13 and 14. All other passengers were required to answer all questions. Race or people: Race was traced through the father; for example if the father was English and the mother was Scottish, the race or people was English. Object in going to Canada: Passengers were instructed to write “To make my home” or “to visit”. Returning Canadians were instructed to write “Returning to my home”. Destined to: An explanation was required concerning the passenger’s intended destination and their relationship to the person whose name was given as well as the Canadian address. If no name was given; passengers were instructed to write the full Canadian address of the destination. For more information about the Form 30A records, consult the archival description. When consulting the Form 30A records, be aware that in most cases each form was microfilmed with the backside first, followed by the front of the form. Form 30A: Dmytro Zmendak, 1923. RG 76 C1j, reel T-15248. 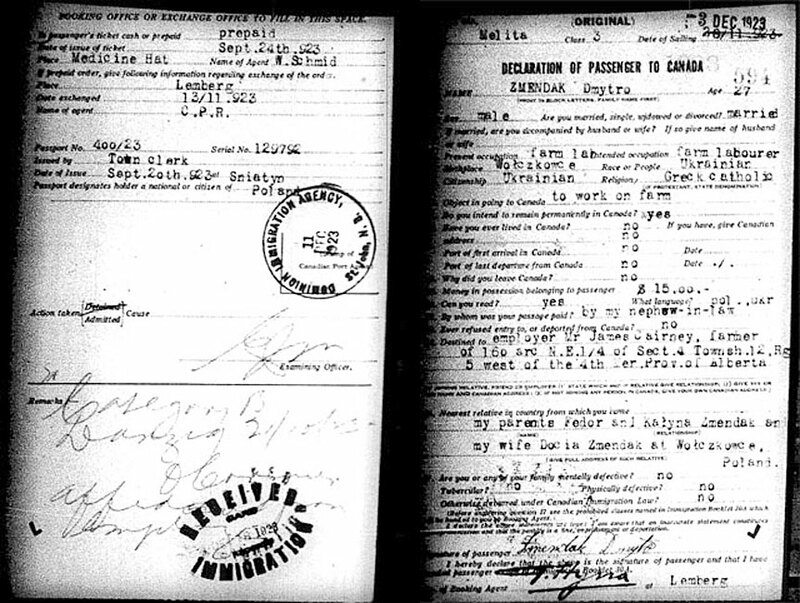 Other archival immigration records exist. Consult our Genealogy and Family History page on What to Search – Topics: Immigration and Citizenship for more information about those records.